The intelligent skincare with system. Only three steps to a perfect skin. As your certified REVIDERM specialist in cosmetics in San Pedro de Alcántara, you obtain optimized results with our products and treatments. In Beautyworld your skin is best hands! Regular trainings in the REVIDERM academy, exceeding the usual standards, ensure a competent consultation and treatment. Your can be sure that all cosmetic treatments and skincare products are exactly and personally adapted to meet your skin´s needs. REVIDERM skintelligence offers you a skincare system, based on the harmonization of innovative science of highest quality with the powers of nature. An innovative combination of skin-identical and skin-active agents combats the causes of the ageing process and provides your skin with everything that is needed to unfold its full beauty. All products are free of ingredients that have the potential to cause allergies and irritating preservatives. Understand your skin. Your individual lifestyle determines the needs of your skin. Similar to nature, the needs of your skin are constantly changing, because of the seasons, stress or external and internal factors. In this relation your REVIDERM cosmetic specialist analyses periodically your skin and defines intelligently the professional treatment and skincare according to your needs. Give qualitative impetus. REVIDERM has developed treatment concepts that activate individually the natural processes of the skin – no matter if for tightening, regeneration or rejuvenation. With the most recent research results from state-of-art dermatology and cosmetology REVIDERM treatments enable you to obtain your individual skincare objective in a natural way. Be active on your own. To guarantee an optimal functioning, both, our body and skin need a regular adequate supply of nutrients. With a regular and consequent application of the REVIDERM skintelligence care system at home, you prolong the long-lasting and visible effect of your dermo-cosmetic treatment in the institute, but also you can slow down the ageing process of your skin. The maximum of effects needs the optimum of concentration of the active agents. With REVIDERM skintelligence you can be sure that your skin is supplied with all active agents that are needed to unfold the highest potential: In the basal layer where new cells grow. You are thinking that all types of skincare are the same? This is an error! Our skin acts as an effective defence mechanism. Under normal conditions non-skin related substances are not able to penetrate very deeply. This happens also to cosmetics which actually have the function to help. Thus, REVIDERM has developed so-called “transport systems” which avoid these protective mechanisms and therefore, enable a penetration of the active agents. On the left: Without the transport systems the active agents cannot penetrate. On the right: Transcutaneous transport systems open the way for the active agents to penetrate into the deeper layers, where new cells grow. Which function has every active agent? 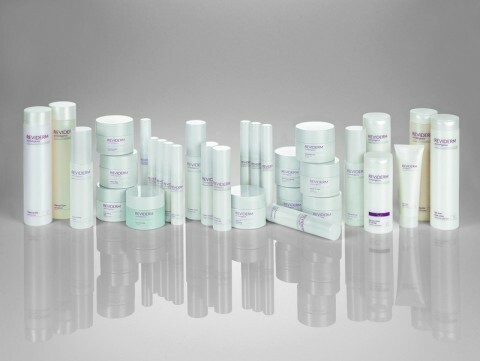 Based on the most recent results from dermatology and cosmetology, the REVIDERM research has developed a dermo-cosmetic skincare product line that offers effective solutions to every skin type. In cooperation with international research groups, only selected, tested active agents are integrated into innovative formulations. The optimum concentration as well as the deep penetration of the active agents guarantees a smooth complexion with a noticeable softness in touch. The commitment of REVIDERM as manufacturer of dermo-cosmetic skincare products is to produce exclusively high standard products in harmonization with nature and to ensure an optimum compatibility. The constant quality controls of REVIDERM guarantee a high effectiveness and safety. Choice, adequate dose and concentration of the active agents are responsible for optimum results. REVIDERM does not compromise and gives your skin as much as it needs. Only then can REVIDERM guarantee you excellent and long-lasting results. Your real mirror image will confirm this to you every day. This treatment regenerates and stimulates demanding skin. The hydrolage is a special treatment to achieve a deep moisturising. 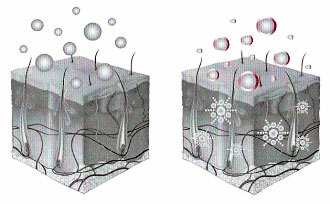 All active agents are able to penetrate deeply into the skin. A natural and regular lifting-effect also tightens the connective tissue. This treatment is adequate for a very intensive care within a short time. High-quality products combined with blood flow stimulation and the REVIDERM Hydrolage supply your skin and stimulate the cellular activity. This treatment is suitable for skin types that are sensible to impurities with inflammatory states. After a deep cleansing and reduction of deposits, the skin’s oil production will be regulated with a soft and long-lasting effect. Pores are refined and anti-inflammatory active agents soothe the irritated skin. This treatment is perfect to preserve the skin´s firmness and tightness. At the same time, it avoids the production of impurities and an oily shine. A soothing treatment with an intensive moisturising reconstructs the balance of the skin within a short time, with a long-lasting effect and gives the skin a regular and smooth appearance. Especially for sensible, irritated and rough skin the balancing and anti-inflammatory effect recovers a smooth and soft skin tone. This is a treatment for skin with severe hyperkeratosis. Very horny skin will be eliminated. The skin experiences an energy boost and is intensively stimulated. It is ideal for tired or mature skins and very suitable for problem skins to intensively balance the skin’s functionality. Controlled Whitening is a special treatment for the reduction of pigmentation disorders such as age spots and hyperpigmentation due to sunlight. The cellular metabolism is activated and new (lightened) cells grow. The complexion lightens with every treatment. 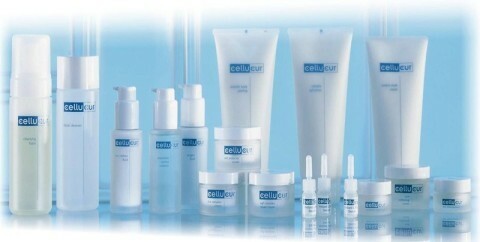 The cellucur concept has been developed to treat strongly demanding skin. This series includes special treatments and effective solutions for problematic skin such as impurities due to puberty and hormones, rosacea (couperosis), irritations, cellulite or scars.